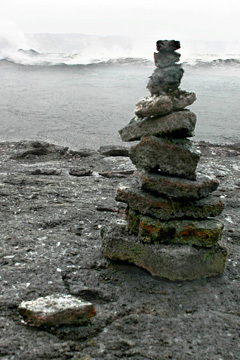 Solid lava is sometimes broken to create rock piles, such as here at Halemaumau Crater. Park rangers will start enforcing a ban on stacking rocks in the park. Hundreds of rock stacks have been cropping up at Hawaii Volcanoes National Park, and officials say the people responsible for the illegal rock piles could face six-month jail terms and $5,000 fines. That's for defacing or disrupting a national geological feature. "Visitors can help protect the park's dynamic landscape by leaving everything -- even the rocks -- in its rightful place," Park Superintendent Cindy Orlando said. Orlando said rangers will begin a campaign to educate visitors and tour operators about the importance of preserving the park's beauty. Park officials note that sometimes loose rocks tell a story of an eruption, such as the one at Halemaumau in 1790, when an army of warriors was annihilated by the explosive force of pulverized rocks. The geologic features also continue to help scientists interpret the occurrence of eruptions on the Big Island. Park spokesman Mardie Lane said native Hawaiians stacked rocks to mark the location of land division boundaries known as ahupuaa. She said park rangers sometimes stack rocks to mark a trail. By stacking rocks themselves, visitors could disorient other hikers, Lane said, as well as disrupt the location of traditional native ahupuaa markers. Lane said the rock piles seem to be concentrated at visitor stops at the 1971 lava flow at the southwest rift zone, at Halemaumau, and at the 1982 lava flow. She said some of the stones have been pried off the surface of nearby lava flows. "In the process, they are substantially disturbing, if not destroying, the physical evidence of past geologic events," Lane said. "The rocks are still there, but their story value has been lost. ... The construction of rock piles erases geologic history. ... They erase Hawaiian history." Hawaii Volcanoes National Park, which was established in 1916, has about 2.5 million visitors a year.